The wealthy parents accused in the sweeping college admissions cheating scandal have been pilloried, and some have lost jobs. They face prison time if convicted in the massive fraud scheme. Now, sources say some of them are under pressure to cooperate with federal prosecutors, who are looking to expand the case. Prosecutors got the cooperation of the alleged mastermind of the scheme, who in turn provided evidence about dozens of parents. Legal experts said they would not be surprised if many end up making deals to avoid harsh punishment. Why would it make sense for parents to cooperate with authorities? Former Assistant U.S. Atty. Neama Rahmani of West Coast Trial Lawyers said prosecutors can use their leverage in cases such as the college admissions scandal. “Almost everyone in these cases cuts a deal and cooperates,” he said. “There is a lot of pressure on the parents to accept responsibility, cooperate and plead guilty. Otherwise, they may be held responsible for the entire amount of the fraud and corresponding prison time under … the conspiracy charges. How did the admissions scheme work? It centered on a Newport Beach college placement firm run by William “Rick” Singer. 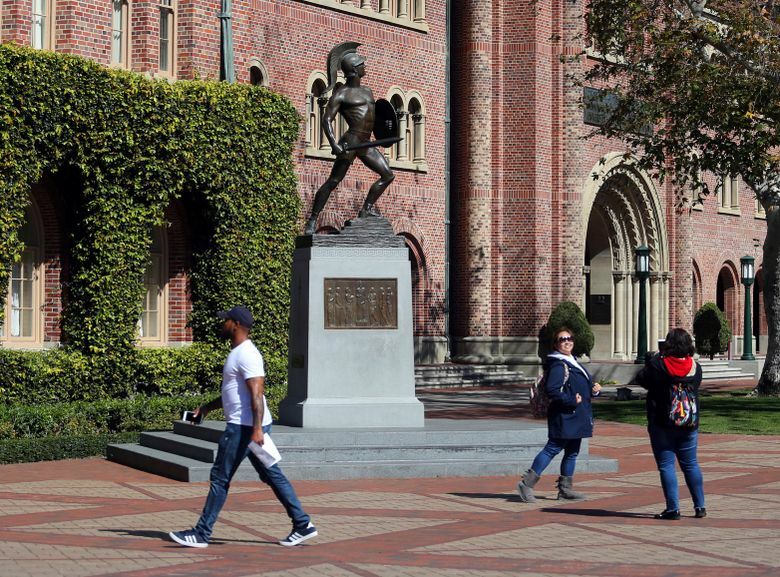 Wealthy parents are accused of paying Singer to help their children cheat on college entrance exams and to falsify athletic records of students to enable them to secure admission to elite schools, including UCLA, USC, Stanford, Yale and Georgetown, court records show. Prosecutors allege that Singer instructed parents to donate funds to a fake charity he had established as part of the scheme. Most of the parents paid at least $200,000, and some spent up to $6.5 million, to guarantee their children admission to top universities, authorities said. The parents received the added benefit of being able to deduct the donation from their income taxes, according to the Internal Revenue Service. The scheme itself was fairly simple, prosecutors said: Singer told parents to seek extended time for their children on ACT and SAT exams. In at least one instance, a student claimed to have a learning disability to obtain medical documentation required by the College Board and ACT Inc. to grant additional time on the tests, according to court documents. How can the parents defend themselves in court? Some attorneys have cast doubt on the government’s ability to show who was harmed in the far-reaching scheme. “It’s not clear that these students would have been rejected had the parents not paid bribes. Would their scores have disqualified them? There’s no way to know that or to establish that other students would have been given their spots,” said Lara Yeretsian, a defense lawyer who has worked on other celebrity cases. The criminal case is not the only legal battle the parents face, right? Yes. Several civil lawsuits have also been filed. An Oakland woman filed a $500-billion class-action lawsuit against two Hollywood actresses and dozens of other wealthy parents accused of paying hefty sums to bribe college coaches or doctor exam scores to secure their children’s admission to elite universities. Jennifer Kay Toy, a former Oakland schoolteacher, alleges in the lawsuit filed in San Francisco County Superior Court that the actions of those implicated in the scheme prevented her son, Joshua Toy, from being admitted to several colleges ensnared in the scandal. She wrote in the filing that her son worked hard and graduated from high school with a 4.2 GPA but was still rejected by some of the colleges. Actresses Felicity Huffman and Lori Loughlin and Loughlin’s husband, fashion designer Mossimo Giannulli, along with dozens of other people charged in the criminal case, are named in the lawsuit. The court filing does not specify the colleges where her son applied or when he submitted his applications. Two Stanford students also filed a federal class-action lawsuit, implicating Stanford, USC, UCLA, the University of San Diego, the University of Texas at Austin, Wake Forest University, Yale University and Georgetown University. The students allege the rigged system denied them a fair chance to matriculate at the elite institutions and could tarnish their degrees from Stanford. Visit the Los Angeles Times at www.latimes.com.